The University of Iowa has a long history of commissioning inspirational architecture and pioneering art education. The first university to grant credit for creative work in the arts, it gained renown in the 1930s for radically combining its art and art history programs into one school. Seeking to enhance its art program, it awarded the commission for a new building to Steven Holl Architects because of the firm’s particularly sensitive understanding of both the mission and programmatic needs of the art school. Partially straddling a pond and an adjacent limestone bluff, the building’s assemblage of glass and Cor-ten steel planes is woven into the site, creating new campus spaces, pathways and connections to the landscape. 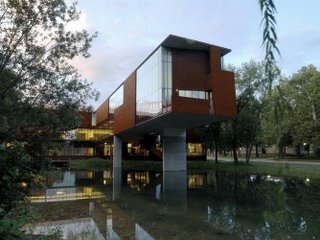 Necessitated by the constraints of the site, an elevated wing containing the library program extends out over the pond, with reading spaces engaging the vertical landscape of the bluff to one side and the existing art building to the other. The building is already functioning as a social generator for the University before its official opening. An outdoor terrace around the pond has become a popular gathering area for students, faculty, and people from the surrounding community. Campus traffic is drawn into the building at multiple points. Within the building, “formless” spaces work as a condenser of people, practice, and theory. The 70,000 sq. ft. building houses an auditorium, classrooms, an art library, studios, an art gallery, faculty offices, meeting rooms, and a café. 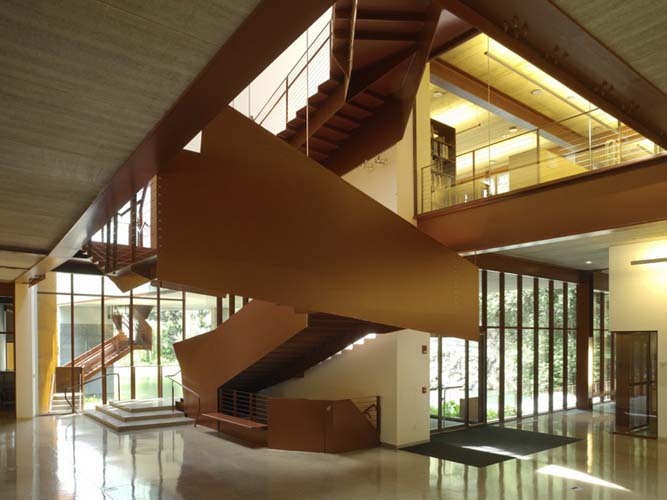 A public route follows the contour edge of the pond and extends vertically up into the building’s central atrium by a suspended stair of red folded steel plates. Main horizontal passageways and meeting areas provide communal spaces essential to the interdisciplinary approach of the School. Glass walls line the building’s interior passages, revealing works-in-progress within studio classrooms and giving views throughout. Roof planes of concrete planks are folded up to diffuse an even north light throughout the art studios giving new expression to the prototypical artist studio skylights. In warm weather studios open up to exterior balconies. Natural finishes and exposed materials such as concrete floors and ceilings give material character to the new building. Inventive economical construction technologies throughout the building enabled the project to stay well within the budget. Next articleFriday Funny: A new office game!